One of my favourite parts of #etMOOC was our time exploring open learning. @cogdog (Alan Levine) collects stories of open learning and sharing here. It is a concept I am committed to, and my own personal stories of open sharing are dear to me. Sharing can be hard, though. We need courage to share. Depending on the context, it can be hard work. I am often asked to present to groups. This is not my strength, and it involves lots of preparation time, but I push myself to do it because I usually benefit from it far more than my audience. It is a way to collect, organize, and synthesize thinking, something I rarely do unless pushed. Last Friday, I pushed a grade 9 student at my school to be courageous and share on the radio the part she played in our lip-dub video project with our student teacher and Dean Shareski. She did a beautiful job, but it was scary, and I applaud her courage for consenting to speak to CBC Radio. All of the students in our lip-dub project needed courage to put themselves out there and participate. Oh but the rewards! They were seen by Commander Chris Hadfield on the ISS! Last week a teacher colleague pushed the boundaries and shared professional learning on Twitter. It was courageous, because we are not all fortunate enough to be working in environments that support the idea of open learning. 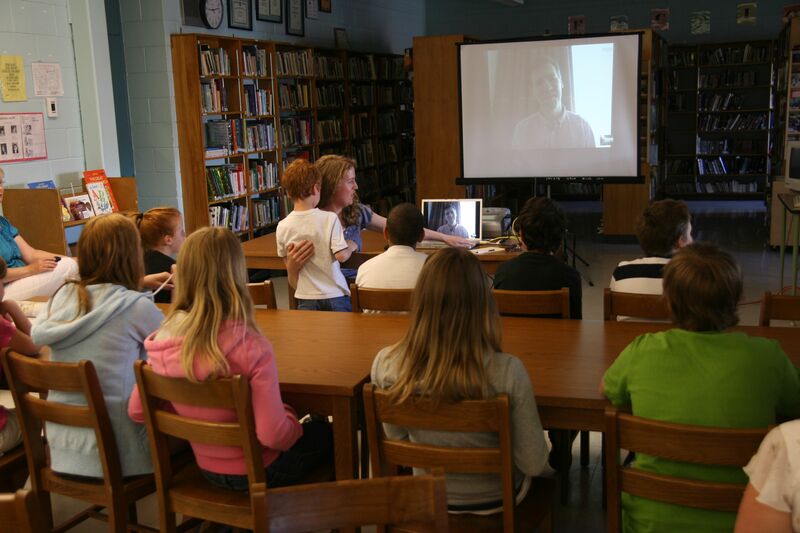 Jeff Kinney generously shares his time with students at NRRDHS through Skype. There is still much stereotyping about “cell phone use” during professional development. “Cell phones” are not there as a distraction, but as a tool for learning. Other educators benefit from our sharing. Learning networks are critical, especially in isolated locations like ours. Sharing pushes our thinking and helps us to learn better ways to teach our students. When I see courageous people sharing, I wonder what it would take to get others to share. Dean Shareski shared this video today. It reminds us that we all have something to share with someone. A teacher from my school attended a session at a conference today, and shared that she could have led that session herself. Yes she could! And next year maybe she will! Two weeks ago, I presented some sessions at #OTRK12. Initially, I had hoped to present on the concept of the TPA (Teacher Performance Appraisal) for online teachers. I was one of the first teachers in Ontario to have a TPA while teaching online (1998), but someone else had asked to present that topic so I decided to just sit in to learn. The presenter was a teacher who had looked at this topic for his PQP Practicum. He presented a beautiful list of look-fors and we had a discussion about some of the interesting twists this mode of instruction presented to the TPA process. He had never actually completed an online TPA, but it was presented very well. But right in that very room, listening with intent, was a principal of an online public high school who has conducted more online TPAs than anyone else in Ontario – and he shared nothing. Imagine how rich the discussion could have been if he had shared his knowledge and experience. As I sit here in a massive spring snowstorm putting the final touches on another application to share (ECOO 2013) a journey with others, I am thankful for the many opportunities I have had to share with so many open learners. Life is richer when you share. Sharing gets easier and better every time you do it, a virtuous cycle. If I could beg one more video out of you, I would love to have the lipdub that reached Cmdr Hadfield, I cannot think of a more awesome example of what can happen by taking that leap. Yes, for sure. I planned to record that story tonight while walking out in our 35 cm of snow currently falling, but darkness got here first. I will get on it this weekend for sure. It doesn’t look like I will be going anywhere for awhile! I like how you mention courage. In my experience so far, there seems to be a few kinds of courage that we need if we are going to change our methods in the classroom, in the school, in the online community. First, we need to have the courage to share. Period. We have to have enough guts to think that what we have inside our heads is a legitimate thought, and others may want to hear/see/read it. It feels like speaking up in class as a student; that terrible fear that maybe your question is just plain stupid. Second, we need to have courage to do this new thing in a community where the majority of those around us may not prescribe to the philosophy of moving forward. Sure, there is a growing and supportive community online, but in your physical space at work, you may stick out like a sore thumb and you may not be seen in the best light. Courage. Courage. I have told you about the wonderful teacher I learned so much from @LSHS who posted courage quotes on a bulletin board at school. It might be a great idea to have these in a physical place in our workspace as well. Often, before a tough conversation, I would walk once around the school and read a courage quote or two to prepare for what I had to do. It really worked. Remember as well that teaching is a profession, with a designation (OCT) and Standards of Practice. When you share, you are helping others with their professional learning, one of the standards of practice. As well, you are demonstrating Leadership in Learning Communities, another standard of practice. Thanks for the reminder that it’s okay to stick out like a sore thumb, and that it takes courage to do this. I actually had a long talk with a colleague (who’s pretty good at taking the tenor of morale in our workplace), and she helped me realize that some of the things I was sharing were making people uncomfortable, because my staff is still recovering from diagnosticians and horrible evaluative experiences at the beginning of the EQAO period, and some of my questions could be taken as evaluative. So….we’ve been working together on ways that I can still ask my questions, and still encourage people to share what’s really working for them, but in a “kinder, gentler” way, if that makes sense. Not dialing back on my courage, still sharing tons of links and ideas and…., but trying really hard to think about where my ‘authentic audience” is coming from. It’s tricky to try to find ways to move forward while balancing the needs of the larger group that you are a part of. Innovation and learning are so incredibly vivid and vibrant in this new edtech world, but there are so many people who work in educational environments who may not see the value in adapting to change. How is a person supposed to be part of a team if they want to move in a direction that the group isn’t interested in exploring? Is that person then seen as an outcast because they have gone against the grain? But how is change ever going to happen if no one moves forward first? Thanks, Donna. I, too, put a proposal together this week for #ecoo13. Scared the heck out of me, but with the support of my husband, and a friend in the IT department at my board, I did it…Starting to realize I need to do this in person, as well as with my PLN. How heartbreaking that the “expert in the room” didn’t share at your workshop – guess he forgot that the smartest person in the room is the room, as @snbeach likes to remind us. It does take courage…but the payoff is terrific. Got a great tweet yesterday from a high school Core French teacher. One of her students had been brave, and photographed her biography board (demonstrating her knowledge of the past tense beautifully), and posted it to instagram, to the attention of the ballet dancer she had chosen to talk about – he not only communicated back, with a positive message, but has sent it out to dancers in his network around the world. What a great response for that student! Such a terrific story, thanks so much for sharing!! 🙂 You may want to share it with @cogdog and add it to the collection. I can’t wait to see you present at #ECOO13. I’m sure it will be amazing. Good for you!